Earlier this month, the UK government’s newly-formed Department for Business, Energy and Industrial Strategy (BEIS) published a report which sought to establish whether or not a relationship existed between ambition of SME leaders and their business’ future growth. You can see the tabloid headline now: ambition breeds failure for female entrepreneurs. Is this really fair and can we genuinely stand to believe that ambition in women is a hindrance when it comes to starting a business? Another government-run survey published in May 2016 found that 21% of SMEs were majority-led by women. Looking more in-depth at the data we learn that only 15% of medium-sized businesses were run by women, and 21% of small and micro businesses. Is the fact that women predominately run smaller-sized business yet more evidence of female entrepreneurs lacking growth ambition? The odds are stacked against women in business, but surely there is a bone to pick with this aggregation of selective statistics. What’s the real story behind the raw data? In direct contrast to the government reports above, the 2016 BNP Paribas Global Entrepreneur Report found women to be slightly more successful than their male counterparts, with 61% of female entrepreneurs expecting profits to rise over the next year compared to an average of 58% across both genders. The Burt Report, published back in February 2015 stated quite explicitly that female entrepreneurs were an “under-utilised economic resource” in the UK economy, supporting this claim with findings from The European Institute for Gender Equality who agreed that an increase in female business owners would add to the quality of the business population. 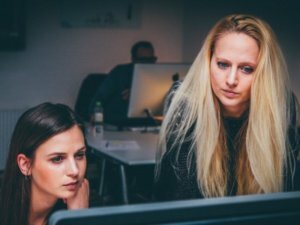 The Federation for Small Businesses (FSB) also voiced support for women in business, in April this year releasing their Women in Enterprise: The Untapped Potential report which outlined key recommendations designed to encourage female entrepreneurship. The report effectively concluded that not enough data is being gathered relating solely to the gender gap in business ownership. This is hindering policy makers from making fully-informed decisions when it comes to encouraging female entrepreneurship. If we had studies which were directly aimed at analysing gender disparity in this area policy makers would be better resourced to make informed decisions rather than inferring findings from other reports on general business population and growth statistics. So if the data collected by the BEIS is unfit for purpose in terms of analysing gender differences among business owners, what does this all mean in terms of the negative ambition and business growth relationship they then identified? Whatever the government report concluded, ambition cannot be positioned as a gender-specific characteristic and therefore should not be used as a differentiating factor when it comes to business growth. There may seem a direct correlation on paper in particular studies, but this does not mean that ambition can be singled out as a reason for lower growth rates among female SME leaders compared with their male counterparts. Admittedly, the report does not make that claim but it does infer that ambition is a meaningful factor in business growth. In fact, it notes that the proportion of male-led and female-led businesses that have grown in sales and size was practically identical. Ambition is however inferred as a gendered concept, though the report offers the explanation that questions may have been answered differently between men and women, but also between different groups of women, who experienced different socialisation of gendered expectations. Looking at the data more closely, and supported by ONS Labour Market statistics gathered back in 2013, we find that female-led businesses tend to sit in the health, social work, community and personal services sectors. Women are also more likely to head up a charity (51%). These sectors are ones which tend to have lower levels of business growth, regardless of who runs them. They also tend to have smaller turnovers. By contrast construction, transport and communications businesses tend to be male-dominated, and they also tend to boast higher levels of growth and profit. This is not because they are run by men but because this is inherent in the nature of those industries. 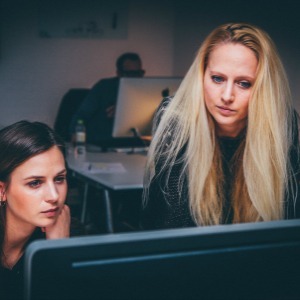 So why are women underrepresented in industries which boast higher growth rates and turnover? That is a different question which is better answered in terms of education and the encouragement of women to study STEM subjects. For now though, we can conclude that it is not the want of ambition holding women back. Women should not be afraid of showing ambition. It shows an inner strength and confidence that their business idea is a good one. Drive, determination and ambition are buzzwords in almost every business guru’s vocabulary, and with good reason. Ambition is necessary for success, whatever your gender. Image by Nick Karvounis, from Unsplash. Used under a Creative Commons Zero licence. Image is of two women, one brunette and one blonde. Both are working together at a computer screen, with concentrated expressions.